New flags in Marble Arch Park from 22 May – 7 June! 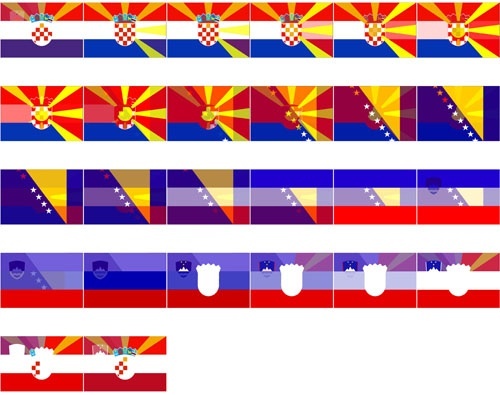 As part of The Sweetest Dream, Nada Prlja's project, 'Advanced Science of Morphology' reworks the national flags of the countries of the former Yugoslavia. The new 26 flags will replace the flags representing the countries belonging to the European Union that usually fly by Marble Arch. On 7 June these new flags will be carried in a procession from Marble Arch to Space gallery in Hackney where they will be ceremonally installed in The Sweetest Dream exhibition during the opening party. Keep an eye out for the changing flags in Marble Arch Park from 22 May – 7 June. As part of The Sweetest Dream, Nada Prlja's project, 'Advanced Science of Morphology' reworks the national flags of the countries of the former Yugoslavia. 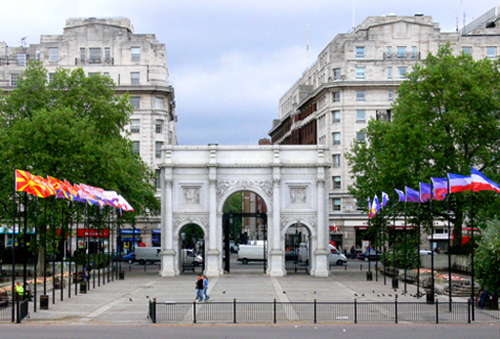 The new 26 flags will replace the flags representing the countries belonging to the European Union that usually fly by Marble Arch. On 7 June these new flags will be carried in a procession from Marble Arch to Space gallery in Hackney where they will be ceremonally installed in The Sweetest Dream exhibition during the opening party.